This page has information on what to do in the event of a fire on either your vessel or another person's. Raise the alarm (to others onboard and to rescue organisations). Manoeuvre the vessel to operate with the least wind effect (generally downwind). If within an enclosed or confined space, close all the hatches, vents and ports to reduce oxygen. If a burning object can be safely moved, get it over the side quickly. Shut off fuel lines and gas lines as soon as possible as flexible fuel lines may collapse and add to the fire. Try to extinguish the fire with fire-fighting equipment and direct the extinguisher into the heart of the fire not at the flames. Maintain a watch on the area once the fire has been extinguished to monitor any re-flashes. In an emergency, ensure you are wearing your lifejacket. Fires on other craft are indicated by large black smoke palls. Be extremely cautious as you approach and keep to the windward side of the vessel on fire. 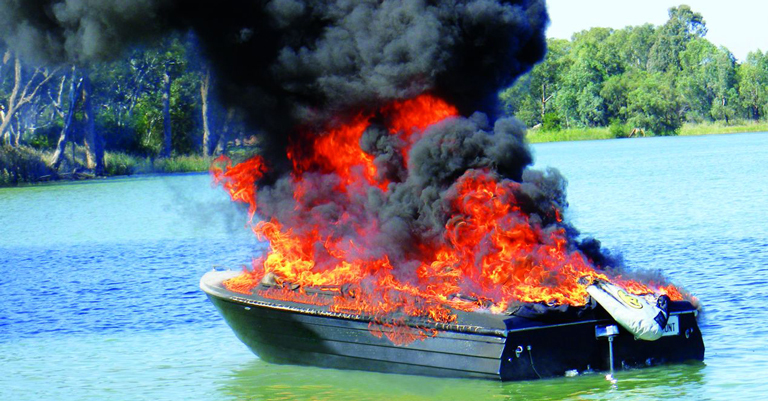 Remember most fires on small vessels originate from fuel, heating appliances, stoves, leaking gas or fat. Fuel and gas fires spread very quickly.